Today the new Kiteboarding season started! I went to the Baltic Sea to Prerow a.d. Darß to have a great day on the water with lots of sun and approximatly 15kn. Even though it is still not real summer temperature one could stay on the water for a good hour without wearing gloves and a hood and still wasn't freezing to much... That gives hope for the next weeks do be the beginning of a great season. The forecast predicted 17kn from North-East - which I missed since I arrived at 6pm. But anyways there were 13-14 knots and it was a beautiful sunny day - so I went out with the 12m² LITHIUM for about 1,5 hours until the wind totally quit. 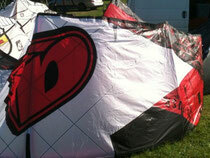 Now it's official - I am new Testcenter for Airush Kiteboarding.